. 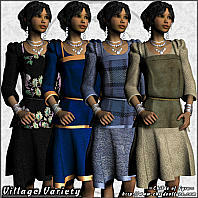 :: COF Village Variety for Evil Innocence's Village Girl ::. This was a package that I used to sell on Content Paradise. I have since closed that store and am in the process of moving some things into my HiveWire store. Other things, I am putting into my freebies instead. This is one of those that I am moving to my freebies. 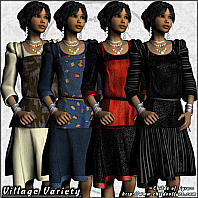 Village Variety is a texture package intended for use with Evil Innocence's "Village Girl" dress. There are 14 different textures for the dress, and the default transparency options also work on these textures. These textures use a mix of JPG images and Poser material room procedural textures. As a result, this package is deemed to be Poser-only. If you do choose to use this in DS, you will need to do very extensive material/texture alterations! Back when I first released this package, I also released a second, much smaller package as a freebie. That smaller package only has 4 textures in it, that at the time I just didn't feel they fit into the rest of the pack. So, if you also want to pick up the other 4 textures, you can find those on THIS PAGE for free download as well.